Be honest Ady, when no one else was around, did you play around in the cockpit? Ady has said the entire time that only the OT is canon for his edits, and when he still planned to edit the PT it would have been altered to match the OT, not the other way around. And that he wonâ€™t be editing anything to fit the Disney films since thereâ€™s no guarantee a future film wonâ€™t contradict something he did as we learn more about the new canon - best to keep it all internally consistent with the OT itself, since thatâ€™s less likely to cause issues. It is kind of amazing. I donâ€™t begrudge Ady at all, since itâ€™s his meticulous dedication thatâ€™s making the absolute gold standard for fanedits, but the timescales here (enough to generate nostalgia) are nuts. Iâ€™m sure thereâ€™re a handful of us that check these threads not far off daily, and yet, for all we know, weâ€™re looking at another decade or so until we see Eps 4 and 6. And yet weâ€™re all along for the ride, because we know Ady is going to deliver something incredible for the amount of time spent. More of my boring rant here: https://originaltrilogy.com/topic/Cant-be-Bothered-justifying-Reys-power-vs-Lukes/id/67001#1278035. I personally donâ€™t feel thereâ€™s enough good in any of the new movies to warrant salvaging them with edits (except perhaps Rogue One). It was inevitable that some would try though, and good luck to them! Why they made the Ewoks blink but left Yodaâ€™s eyes like that is beyond me. FIRST PROPER CLIP FROM ROTJ:R.
Here is the first clip that has some FX work added and some editing tweaks. 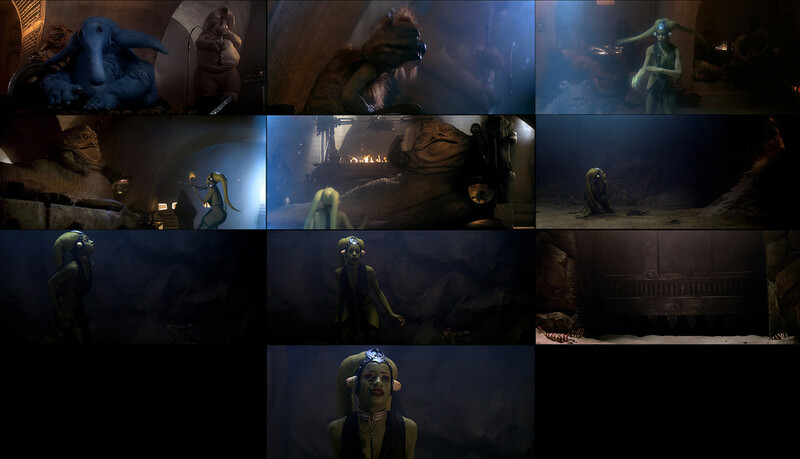 Although the torture of the droid at the beginning is likely to be removed in the final version, everything is pretty much as it will appear in ROTJ:R. Tweaks done to Jabbaâ€™s & Syâ€™s mouth, a blink now and then on the creatures ( only one is complete so far in this), re-edited the original, integrating some of the SE shots, and organising shots to sync up better with Syâ€™s vocals. Using the great 4k83 restorations as a basis for this, along with the blu-ray, some colour grading (which is still in progress) and some more scratch/ speckle clean up work to be done. Some FX work needs to be done on a couple of shots where i need to fix the background ( mainly the side shot of Oola from the SEâ€™s where they shot her against a blue-screen but added a character in the background that isnâ€™t there in the shots before or after)Sound is, as usual, a very rough temp track as the sound side of things wonâ€™t start until the visual side of the film is completed. Looks great. Very happy to see Lapti Nek is back. That picture looks great for that scene. The BluRay is cast in a deep blue. It looks like youâ€™ve cut it in such a way to favor BluRay-sourced footage, but it shouldnâ€™t be noticeable unless someone has the original scene committed to memory. Thanks, Ady! Lookinâ€™ good! ðŸ˜ƒ I know the audio is temporary and whatnot, but will the timing/animation be tweaked for the first time Jabba says â€œboska!â€�? (or whatever it is) Not sure why they had him say it twice, maybe as a way of showing his anger or frustration. This is looking great, Adywan! Iâ€™ve been waiting for ROTJ to finally come around! Thereâ€™s probably no point in my pointing this out because youâ€™ve probably already seen it buuuuut: at around 33 seconds into the clip Sy raises her arm and you can see the rod that operates it. By-the-way, how have I never noticed the fireplace behind Jabba? There are all kinds of cool details in Jabbaâ€™s joint.